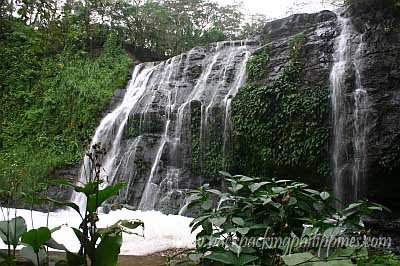 Probably the nearest waterfall to bustling Metro Manila is this talon in Antipolo City located inside a national park-- Hinulugang Taktak. 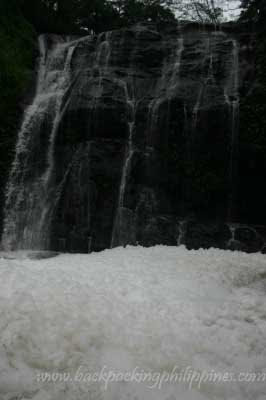 Legend has it that the falls got its name when people threw a bell on Taktak creek thus the name Hinulugang Taktak. Tutubi was able to visit this waterfall on his way back from Antipolo Church, the Shrine of Our Lady of Peace and Good Voyage when he had his car blessed last January of this year. From there he and his family held a short picnic in the park's tables and surrounding lush forest. Expect a minimal entrance fee to enter the park plus rentals for cottages and cabanas inside for picnic tables. There are comfort rooms inside. There's also a swimming pool open to the public. Perhaps the feedback you really need to know about Hinulugang Taktak is that it's not well-maintained even dugyut to some extent-- hinulugan na ng basura, tinaktak pa! Commute to Hinulugang Taktak is fastest if you can take the LRT 2 to the end station of Santolan where you can ride jeepneys going to Antipolo. Jeeps to Antipolo are also available in Cubao where you alight on Taktak road then transfer to a tricycle or walk towards the falls. be prepared to pay minimal Hinulugang taktak entrance fee/admission. there's also a swimming pool open to the public. call hinulugang taktak contact number for swimming rates and other inquiries and events. This reminds me a bit of Bridal Veil Falls in Provo Utah USA. We don't have waterfalls over here in Belgium, our country is very flat. I had very fond memories of Hinulugang Taktak as a child as my parents brought property along the road above, that leads to Chateu Vieux. Everyweekend I'd be there, harvesting from our fruit trees and manning the ice cream kiosk that served as my practice to doing business when I got older.